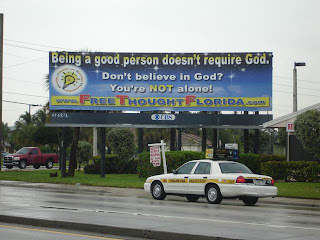 I am sure you remember the recent atheist billboard that went up in Fort Lauderdale, FL. I suspect you've also heard about the subsequent Christian protests of the billboard and the local media's description of it as "controversial." Many atheist bloggers have already sounded off about the situation, so I merely want to echo some of the great points that have already been made. The billboard is located next to a Christian-owned business. The billboard is located in a predominately African American community. I'm going to focus on the first objection because I am honestly unable to fathom how the second is in any way relevant. If someone would care to explain it to me, I'd appreciate it because I just don't get it. The first objection, as explained by area residents, centers on their expectation that nobody will patronize businesses near the sign. Are religious people really so terrified of encountering messages which might differ from their dogma that they would go so far as to avoid this part of town because of an atheist billboard? If so, I would have to assume that these same people would not own televisions, allow their children to attend public schools, or be able to leave their homes without wearing blindfolds! And it’s dangerous for our children to even know that your philosophy exists! ...You have no right to be here! We believe in something. You believe in destroying!